Last week I took a bit of a hiatus from blogging because it was a big holiday week for Canadians and Americans alike. 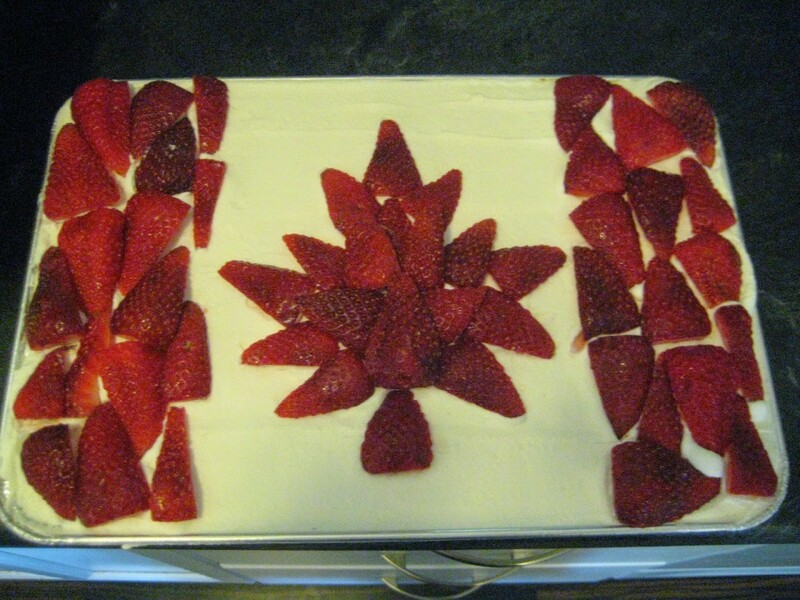 July 1st was Canada day, here in my home country. We celebrate by getting together with family and friends, eating lots of BBQ’d food, and lighting up the skies with extravagant fireworks displays. It’s not all that different of a celebration than that of our brothers and sisters south of the border. Probably the biggest difference is we usually only have one day of celebrations. Americans do it right. They celebrate the ‘birth’ day of their beloved country for an entire weekend (usually). At any rate, I’m sure both Canadians and Americans are starting this week off in a bit of a post-celebratory haze. Not only did we have lots to celebrate last week, but it was bloody hot here as well. Baking something yummy was out of the question because there was enough baking going on outside. We spent the better part of our week tending to our gardens. It’s the first year we’ve been able to have a decent amount of urban space for gardening. If there’s one thing my wife likes more than baking, it’s gardening. She’s been chompin’ at the bit to start harvesting, and last week she got her wish. 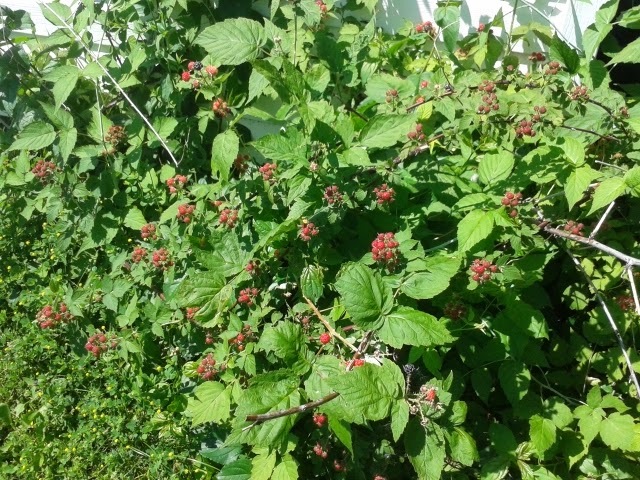 Unbeknownst to us, the previous owners had planted a small, but impressive berry patch in behind the garage. In its glory days it yielded small crops of strawberries, blueberries, and raspberries. A stone’s throw from the berry patch we found several rhubarb plants. I guess the previous owner liked gardening and baking as much as my wife does. Sadly, much of the berry garden had not been maintained in several years, so they required a little TLC. Despite its less than stellar start to the growing season, it looks like we’ll have an impressive crop of black raspberries this year. With more maintenance and clearing away of old brush, we should be able to restore this berry patch to its original splendor in a few years. Every morning, my wife has been dutifully hunting and gathering tiny black jewels of tangy sweetness. I love seeing the delight on my wife’s face when she bounds into my office to show me the spoils of her hunt – and if you’ve never picked raspberries before, it is a bit of a hunt. There’s a lot of maneuvering around sharp spikes in order to pick the ripe berries and leave the unripe ones to mature. Since our raspberry bushes haven’t been maintained in so long, they are a big mass of thickets. Picking those berries becomes extra precarious. You also have to search in and around the plants for the ripe berries. There’s a lot of crouching and bending. This is no easy task for me, but my wife – who happens to be very flexible – (thank you, yoga! ), seamlessly contorts in and out of those bushes. Next year, we hope to make the thickets of berries into more manageable (and safer) rows. The first harvest of the year was small, but my wife has been washing and freezing all the raspberries she picks. 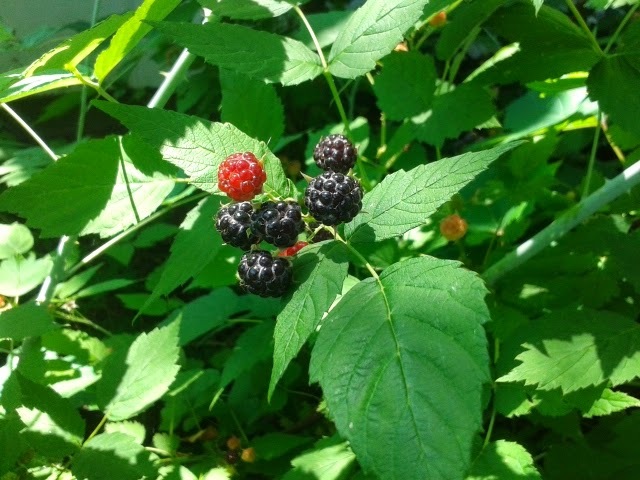 She’s hoping to make a black raspberry cobbler later this week and if the crop is large enough, perhaps some muffins the following week. 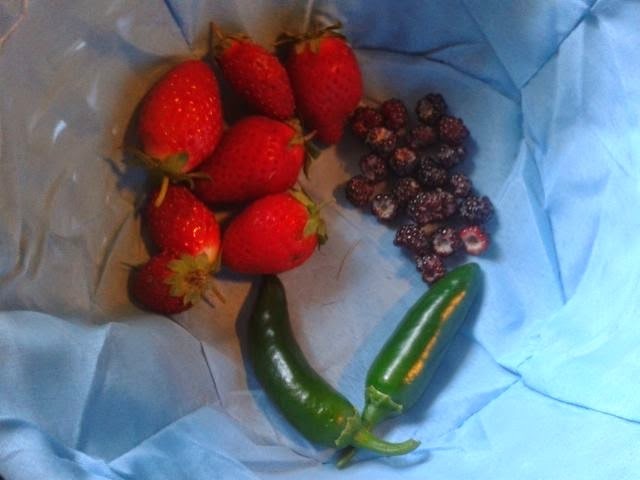 Not only have the raspberries started ripening, many of our herbs have reached maturity, and the jalapeno plant is starting to produce peppers. My wife has some ideas for some savoury muffins with a bit of heat. I’m not going to lie, my wife’s garden is a lot of work. It also comes with a lot of reward. And for any guys out there who think that gardening is ‘women’s work,’ I challenge you to grab a shovel, and get down and dirty. It’s not easy work. After an afternoon of helping my wife in the garden, I’m usually sore and tired. It’s a workout. In fact, my wife likes to say that she has a gardener’s bum. Weeding, pruning and harvesting means she does a lot of squats – and trust me, Gents (and Ladies) – gardening looks good on my wife… but I might be biased.